Icy Dock MB453SPF-B PCSTATS Review - Paperweight or Handy Peripheral? We're going to forgo the usual set of hard drive data transfer benchmarks because they just show there is no difference between a SATA hard drive attached directly to the motherboard, and one hooked up up through a SATA device like the IcyDock MB453SPF-B. The same doesn't generally hold true for IDE drives, but such is the situation with Serial ATA I & II devices. The pace of technology is a beautiful thing isn't it? The IcyDock MB453SPF-B Multi-Bay Backplane Module is a simple 5.25" device which enables users to add three more 3.5" hard drives into a system. It offers easy access to the disks inside, and would be a great unit to use specifically with a three-disk RAID array if your motherboard supports such an option. It retails for about $99 CDN ($ 90USD/£54GBP). Each SATA hard drive is held in its own hot swappable caddy, and can be removed from the unit without digging around in the bowels of your top drawer for a pointless set of keys. There is no way to lock the individual drives into place in the unit, so if security is a concern keep that in mind. The unit is constructed of aluminum and plastic, and should stand the tests of time well enough. Drives slide in and out of the 3-bay unit smoothly, and plugging in the small collection of data and power cables in at the rear of the unit need only be done once. The IcyDock MB453SPF-B's 80mm cooling fans spins quietly, while drawing a moderate amount of cool airflow over each hard drive from the outside front of the case towards the interior. An adjustable temperature alarm can be useful to highlight overheating, but there is no way to disable it permanently. Given all the aspects of the IcyDock MB453SPF-B we've mentioned, it's best attribute is that it doesn't take up as much space as those pesky single slot removeable hard drive racks do. Take for example the Vantec MRK-200ST EZ-Swap unit. That product also supports SATA drives, but installing 3.5" drives requires a few more steps and three of them would occupy a full three 5.25" bays. 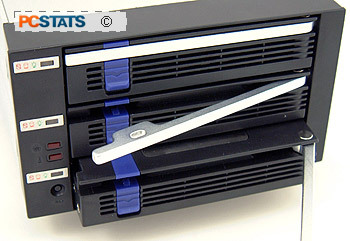 On the whole, the IcyDock MB453SPF-B Multi-Bay Backplane Module is a handy device that is useful to anyone who needs increased 3.5" disk storage space in a desktop computer system. Pg 4. — Paperweight or Handy Peripheral?